Discussion in 'Power Supplies' started by Kyle_Bennett, Jul 24, 2018. The Seasonic FOCUS PLUS GOLD series has been nothing but a crowd pleaser around here. 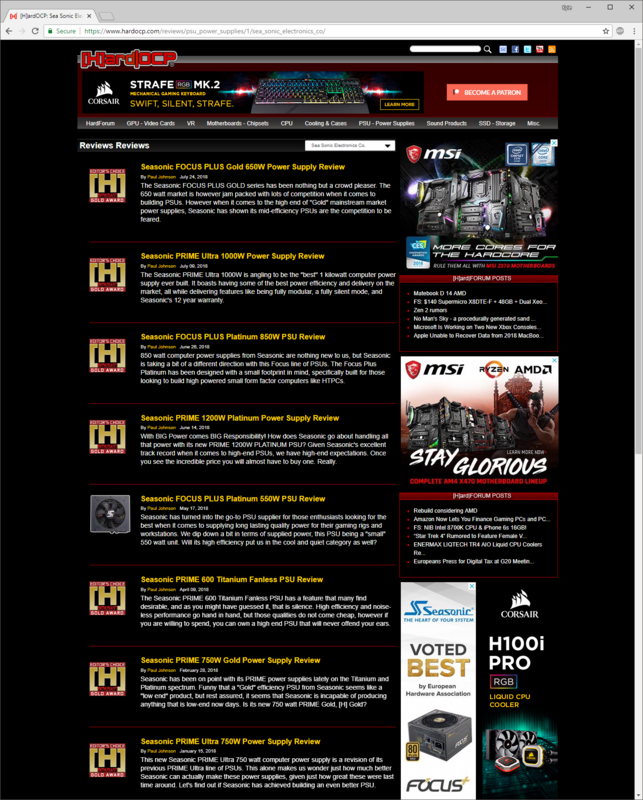 The 650 watt market is however jam packed with lots of competition when it comes to building PSUs. However when it comes to the high end of "Gold" mainstream market power supplies, Seasonic has shown its mid-efficiency PSUs are the competition to be feared. DrezKill and AceGoober like this. Can't they drop the ball, just for a change of pace? This is the end result of when a company actually gives a damn about each and every product they produce. I don't immediately recall ever reading about a Seasonic power supply failing [H] testing or any other review site experiencing failure with Seasonic PSUs. Certainly reinforces my preference for Seasonic over any other brand. Thanks for the review [H]. Greatly appreciated. Vercinaigh, DrezKill, Kyle_Bennett and 1 other person like this. I had an PS fail in one of my older builds and went with a Seasonic FOCUS 750 Gold. I saved about $30 by going with the regular (non PLUS) version. Main difference I see is it's not fully modular, and the warranty is 7 years instead of 10. 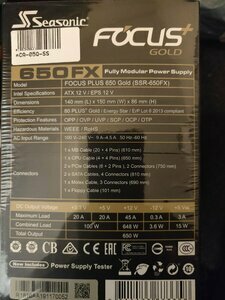 I wonder how the regular Seasonic FOCUS Gold Power Supplies hold up under [H]ardOCP's testing compared to the FOCUS Plus units? Used one of these in my brother's 2700X build, worked great of course. I don't immediately recall ever reading about a Seasonic power supply failing [H] testing or any other review site experiencing failure with Seasonic PSUs. In 2003 or 2004, they released a revision with faulty fan control. The PSUs worked fine, but they were much louder than the previous version. Seasonic quickly worked up a re-revision & handled the RMAs well. So, they haven't been perfect. Just damned near. Dam fine write-up as usual Kyle! I wouldn't expected any less from Seasonic! 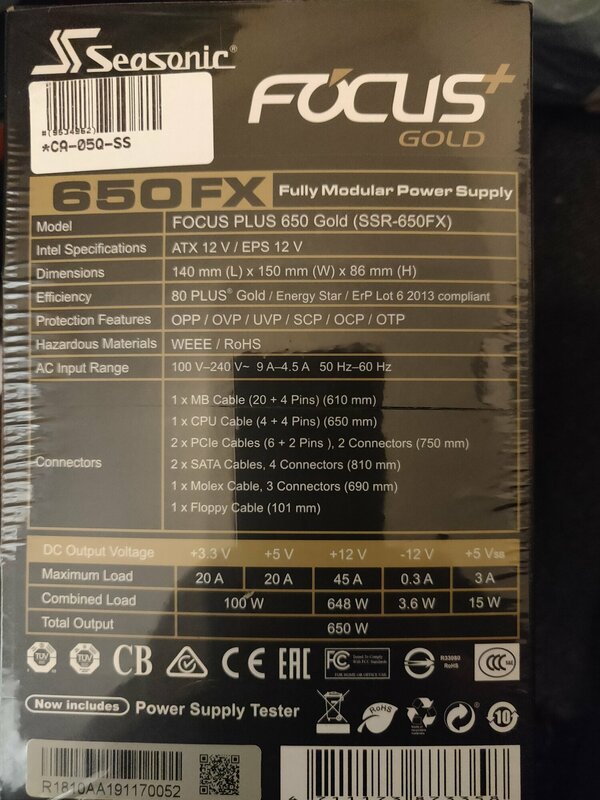 Been using the 650 Focus+ gold in my 8700k system since late November 2017, will report back... in about 9 years. Nebulous and Kyle_Bennett like this. 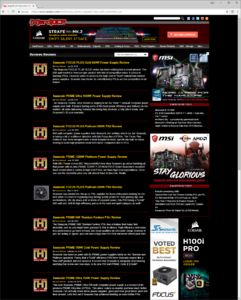 Kyle can you please reach out to Seasonic to see if which of the following has happened? 2 - Labelling error on their packaging. I have just brought this exact PSU expecting to get a PSU with max load of 54A on the 12V rail, but I have the boxed product here, packaging looks similar but not quite same, rest of box is same as your sample. On the side which shows the spec, instead of saying 54A 648W for the 12V rail, it says 45A 648W for the 12V rail will post a picture and also the picture from the HARDOCP review for comparison. Their website also shows 54A vs the 45A on my box. What does the unit itself say? It is probably just a labeling issue since the 550W model is 45A and the packing is the same for all models save for model number and 12v capacity which they use stickers to label often. I am not checking the unit as I have arranged a return to the retailer with it stil shrinkwrapped. The retailer is the largest in the UK, and they are going to contact seasonic about it as they not happy either, and I also contacted support on seasonic's website arranging a response. I hope its a labelling error because I consider bait and switch horrible practice. So you never verified the product but you claim it is bait and switch? That is a horrible practice. Paul I hope you not posting with just the intention to criticise one of your users to protect a brand? Please reread my post I made no such claims, I asked kyle to ask seasonic if its a component swap aka spec change or a packaging error. I do not have the luxury of getting free samples and to open them at will, I am a paying consumer which if I want an easy way to return the product I leave it shrinkwrapped so the retailer is going to more readily accept the RMA. It cost me £100 of my hard earned money to buy the PSU, its not my fault if they mislabeled the box or if they swapped out specifications. But I do feel its the right thing to do to let the community know. LightsOut41 and SvenBent like this. SvenBent and chrcoluk like this. The only horrible pratice is your response here, as you are doing the exact thing you are blaiming others for. Is blindly defending the products and not listening to the user the new approuch on hardocp? LightsOut41 and chrcoluk like this. thanks for both responses guys, I agree with the 648W still been labeled it may well be a typo, hence me trying to find out. Clearly something went wrong and getting clarification should not be shunned upon. I just checked my email and seasonic have responded, will copy and paste word for word. Thank you for contacting Seasonic. It looks like a typo error as the PSU specs didn't change and so are the components inside. Would it be possible to have a picture of the serial number too and check on the PSU if you have the same or not? We will escalate this error asap. I am posting because you made legally actionable accusations without any proof or forethought on your part. It is fairly simple. But I do feel its the right thing to do to let the community know. No, the right thing to do would have been to post after you attempted to find out from the vendor what the deal is. The whole go full blast on social media to get attention mentality is ridiculous and counter productive. Literally a few seconds of basic math or opening the packaging and looking would have answered your question. I am a member of dozens of tech communities, twitter, discord and other forms of social media, if I am going full blast as you put it why did I only post on 2 of these communities. I also would love an explanation of as to how I have posted legally actionable accusations. My question now is what happens on hardforum if a member of staff's post is reported will a "different" member of staff look at it? Even after some neutral observers posted they understood the nature of my post, you carried on with your attack on me, when I was merely seeking clarification, you seem more concerned about your relationship with seasonic than anything else. Yes I posted an opinion about bait and switch but never once did I say this was bait and switch. Actually consider this my last post (to you) in this thread, I dont want to find myself banned, and I wont be reporting any posts. Thank you Chrcoluk for your email about this. As requested, we would like to get the serial number of the product and check all this. Most likely a typo error as the PSU is and will remain the same from the review. We will take appropriate action to change this if there's a typo on current packaging. Once again, thank you for your help on this matter. A pleasant weekend to everyone. chrcoluk and SvenBent like this. Are you really continue for blaming him for doing some thing he never did? Are you either not understanding the very clear phrasing he did or is this just because you cant admit your accusing him was incorrect? At no time did he accuse anyone of bait and switch, he was clearly asking for more information and provide multiple possible scenarios. I wonder what can fuel such a blindly attack on a simple question... monetarily reasons? The fact that you are unable to see you accused Chrcoluk of something he never did, even after it been pointed out multiple times, really puts a question on trustworthiness since you seem to just want to blindly defend a manufacturer. Chrcoluk had a legitimate concern and handled it by the books by asking into it and did not jump to conclusion unlike what you did. You owe chcoluk an apology for your attack on him. Yep I got your email and I will get you the serial number from the box no problem. On both here and OCUK forums I made sure that people know its a labelling issue.